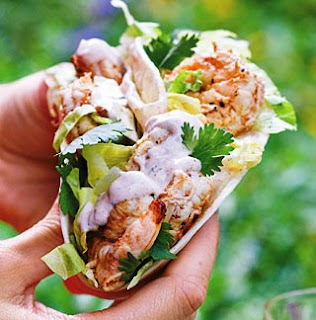 The spicy shrimp and Southwestern sauce on this is really just a yummy shrimp salad served in a flour tortilla instead of a bowl. Southwestern Sauce: Whisk together 1 (16-oz.) container sour cream; 1 garlic clove, minced; 2 Tbsp. finely chopped red onion; 1 tsp. chili powder; 1/2 tsp. ground cumin; 1/2 tsp. ground red pepper; and 1/4 tsp. salt. Whisk in 2 Tbsp. chopped fresh cilantro and 2 Tbsp. fresh lime juice until smooth. Cover and chill until ready to serve. Makes about 2 cups. Peel and devein the shrimp. I suggest buying the 'EZ peel' style which are peeled and deveined except the tail, which you can pinch and twist easily to clean. Thread shrimp onto skewers. Preheat grill to 350° to 400° . Combine seasoning and garlic in a long shallow dish; add lime juice, lemon juice, and shrimp, turning to coat. Cover and chill 10 minutes. Remove shrimp from marinade, discard the marinade. Grill shrimp, without grill lid, 2 to 3 minutes on each side or just until shrimp turn pink. Remove shrimp from skewers. Serve in warm tortillas topped with lettuces, a creamy Southwestern sauce and some cilantro for garnish. Serve with salsa on the side.